For the past few years we’ve been hard at work creating a haven for the good people of South London to escape the whirlwind of cocktail bars, basement venues and chain pubs. What we’ve come up with is a laid back and welcoming atmosphere. Whether you’re looking for somewhere to spend a lazy afternoon, find an evening’s entertainment or simply just enjoy our ever changing menu, perhaps you too can discover why we’ve been deemed “the pick of the bunch” for Clapham pubs by Esquire magazine. Recently voted by Esquire Magazine as one of “Britain’s best”, our garden is something we’re really quite proud of. Providing a relaxed atmosphere away from the crowds and concrete with an excellent music selection, summer parties, regular barbecues and our newly constructed garden bar serving up anything from craft beer to frozen margarita. The historic Landor Pub and Theatre has always been at the forefront of fringe productions, benefitting from the famous Italia Conti Academy just next door. Rather than stopping there however, over the past couple of years we’ve hosted Edinburgh warm-up comedy festivals with the likes of Joe Lycett, Josie Long, Tim Key, Bridget Christie, James Acaster, Mae Martin and Adam Riches, and have plenty of big ideas for the coming months. If the stage isn’t your bag, we also host regular quiz nights, karaoke with a difference (recently listed in TimeOut), live music, DJ’s and garden parties. We also show live sport on our 2 HD projectors and on TV’s inside as well as in the garden. Starts at 8pm. £2 entry per person. £30 bar tab, cash prizes, and free drinks to be won. All major sports fixtures shown including football, rugby & cricket . Our Head Chef Kelley Mosedale brings with her a wealth of fine dining experience having worked in restaurants throughout Europe. With a keen eye for presentation and exceptionally high standards, her ethos focuses on homemade, responsibly sourced food brought to you at a very reasonable price. Since taking the helm she has built a strong team capable of catering for the diverse crowds we attract with a varied and seasonal menu that changes almost every week. Influenced by travel, in the summer months Kelley fires up a barbecue, serving up anything from your classic Beef Burger to Morrocan Lamb and Asian marinated Seabream. 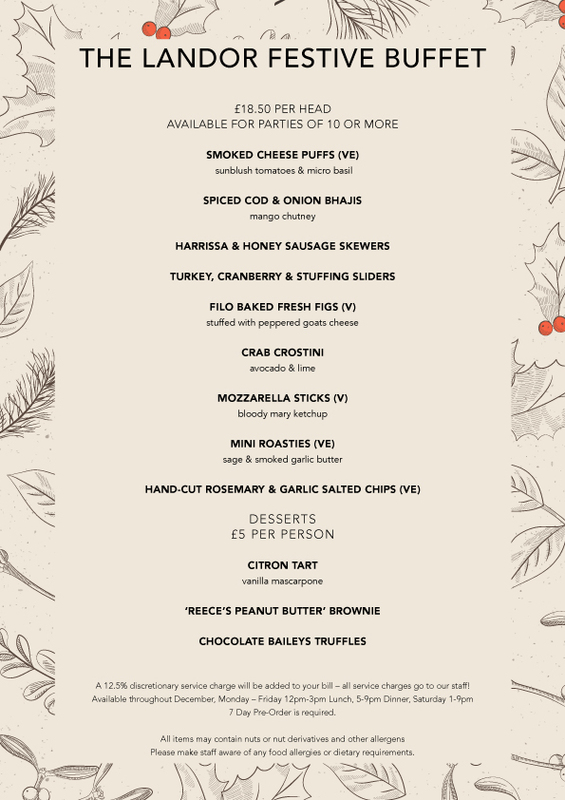 Her selection of Sunday roasts accompanied by artisan stuffing and real gravy are also a big hit in the area – bookings for this are highly recommended to avoid missing out! Please check our sample menus below. 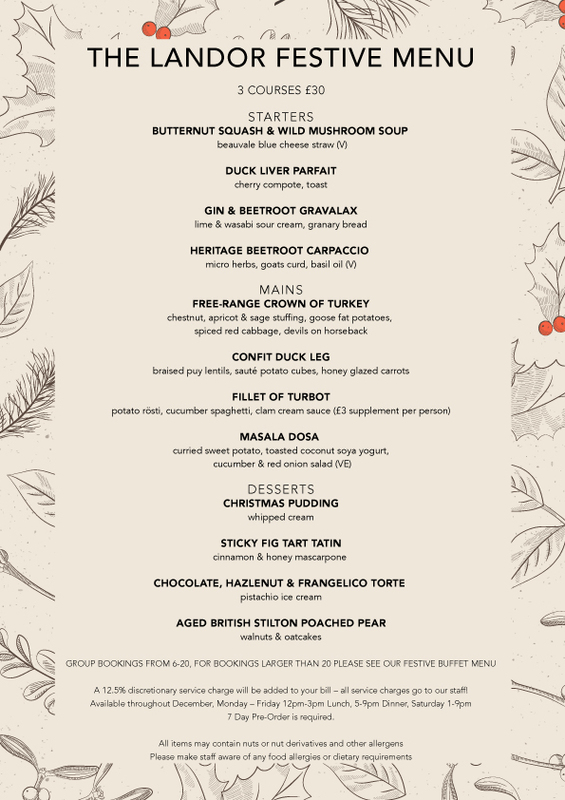 Thanks to all our customers who celebrated their Christmas meals with us in 2018, watch this space for our 2019 menu, released around August/September. While we’re a pretty welcoming bunch and always happy to see you, we can get a little busy, so if you’re planning to travel down mob-handed we recommend dropping us an email to book a table or two in the garden or one of our various bar areas – . To see our latest theatre and stage productions visit here. From Clapham North tube cross the road at the junction and turn right onto Landor Road. Walk down it until you see the pub on your right hand side.